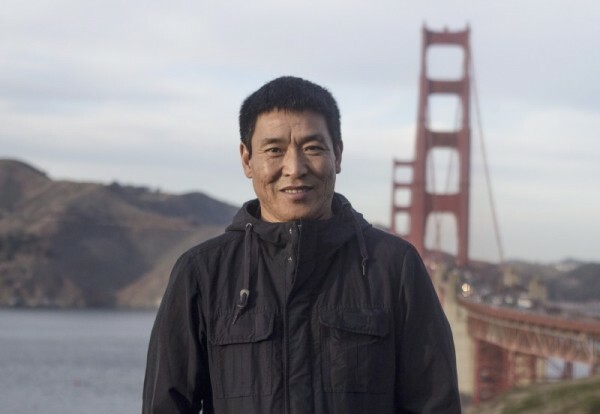 The reports said the escape journey of amateur videographer Dhondup Wangchen, 43, from his home in Sangchu County of what is now part of Chinas Gansu Province was “arduous and risky” but did not say how his escape and arrival in the USA took place. The reports said he was reunited with his wife Lhamo Tso and their four children near the Golden Gate Bridge. Wangchen has spoken of enjoying the feeling of safety and freedom after many years. He has expressed thanks to everyone who had made it possible for him to hold his wife and children in his arms again. However, he was pained to have had to leave his country behind. Wangchen who had previously escaped into exile returned to Tibet and filmed interviews with some 108 Tibetans in various parts of his Chinese ruled homeland with the help of a monk named Golog Jigme over the period of 2007-2008. The two were arrested by Chinese police in March 2008, just after they had smuggled abroad the footage of their video recordings totaling some 40 hours. Zurich-based group Filming for Tibet and Wangchens cousin Gyaljong Tsetrin produced a documentary titled Leaving Fear behind from the footage and released it ahead of Beijing Olympics 2008. The documentary premiered with a secret screening for journalists on Aug 6, 2008 in Beijing, a few days before the start of the Olympic Games, and was later screened in different countries. Wangchen was eventually given a six-year jail sentence in Dec 2009 for alleged subversion, which he completed in Xining, Capital of Qinghai Province, on Jun 5, 2014. But though released, he continued to remain under tight restrictions on his movement and activities at his home due to the deprivation of his political rights for three more years, which ended on Jun 4, 2017. He was said to have been tortured and ill-treated in other ways in jail and to have contracted Hepatitis B there. Representative Nancy Pelosi, the House Democratic leader, whose district covers San Francisco, has said on Twitter on Dec 27 that it was an honor to welcome Mr Wangchen to “our San Francisco community”. President Lobsang Sangay of the Central Tibetan Administration at Dharamshala, India, has on Dec 28 expressed relief at Wangchens safe arrival in the USA. The US-based Committee to Protect Journalists had awarded its International Press Freedom Award to him in 2012 and the European Parliament honoured him with its Václav Havel International Prize for Creative Dissent in 2014. A number of human rights organizations, including Human Rights Watch, Amnesty International, Reporters Without Borders, the Tibetan Center for Human Rights and Democracy, and the International Campaign for Tibet had campaigned for his and Golog Jigmes freedom.